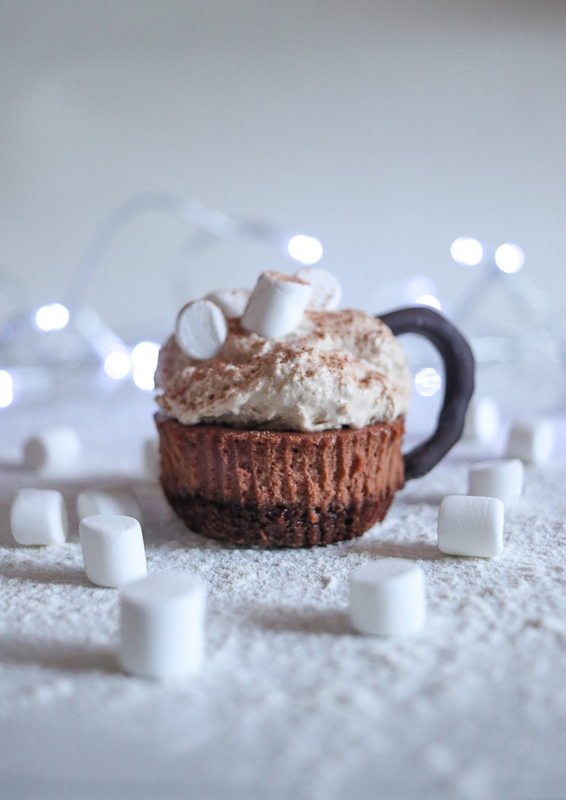 This easy to bake hot chocolate mini cheesecake recipe makes desserts that look like little cups of hot cocoa with whipped cream and marshmallows on top. Are you looking for a simple cheesecake recipe? Well, you’ve found it. Not only is this an easy cheesecake recipe to follow, but the result is also delicious too. Yes, I know these cute mini cheesecake bites look too pretty to eat, but once you taste one you won’t be able to stop. The Oreo cheesecake base is crunchy and buttery, the chocolate filling is rich and silky and the whipped cream topping adds airiness and flavour, not to mention visual appeal. Topped off with the chewy marshmallow, this cheesecake dessert really has it all. Over the festive period, Avonmore asked me to collaborate with them to come up with a recipe using its Baileys Whipped Cream. I have collaborated with Avonmore before when creating my pumpkin soup recipe. I actually used Avonmore products in my first ever blog post for baked chicken and mango curry. So, I was delighted to work with Avonmore again on its Christmas recipe campaign. Click here to see my #splashofmagic campaign post over on Instagram (psst, whilst you are there, please give me a follow. Thank you). 50 – 100 grams of chocolate, melted (the measure depends on how good you are at piping melted chocolate. I used a lot!). Pre-heat oven to 160°C / 140°C fan assisted / 325°F / gas mark 3. Line a muffin/cupcake/fairycake tin with paper baking cases. Firstly, you make the cheesecake biscuit base. Taste test one of the cookies for quality control purposes. Put the cookies in a food processor or Nutribullet and crush until they look fine crumbs. If you are going this by hand, put the cookies in a sandwich bag and bash with a rolling-pin or wooden spoon. Mix the melted butter in with the cookie crumbs. 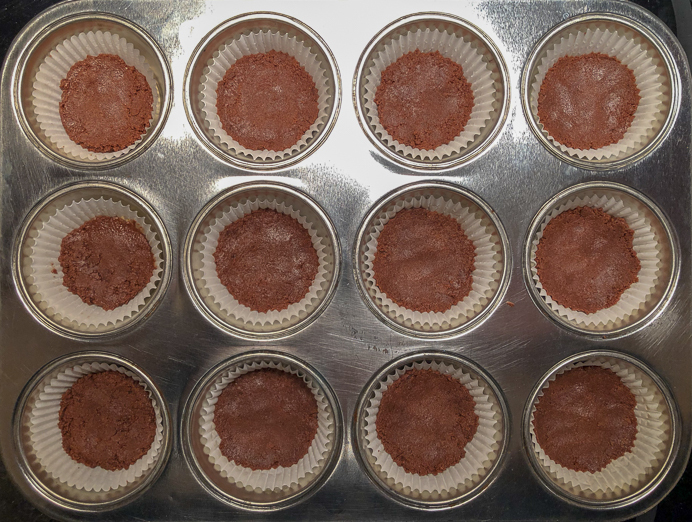 Take the same amount of mixture for each baking case and press into the baking cases. Make sure you press it right into the ridges so you get those nice lines when you remove the paper. Put the tray in the oven and bake for 8 minutes. Next, start making the chocolate cheesecake filling. 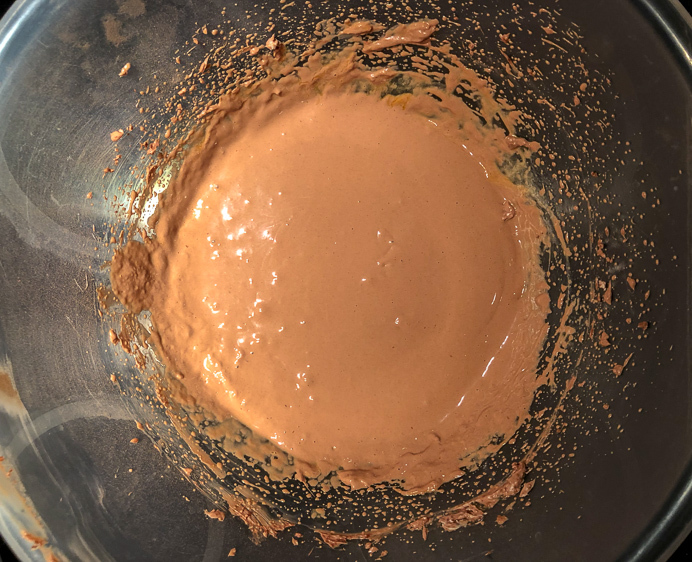 Set up a stand mixer with a paddle attachment or just use an electric hand mixer and beat until blended the cream cheese, sugar and cocoa powder. Add the eggs, one at a time and mix on low-speed. You do not want to over mix. You just want to blend the ingredients together. Pour the chocolate filling evenly over the cheesecake bases. Put the tray in the oven and bake for 20 to 30 minutes, or until the centres are almost set. Do not over bake them. Place on a rack and cool completely. When cool, refrigerate for two hours until set or longer if you are making them ahead. Break the chocolate up into pieces and place in a heatproof bowl and melt in the microwave. Use 30-second intervals and stir after each interval. When the chocolate is melted, spoon it into a resealable sandwich bag. Cut a very small piece off one bottom corner of the bag. 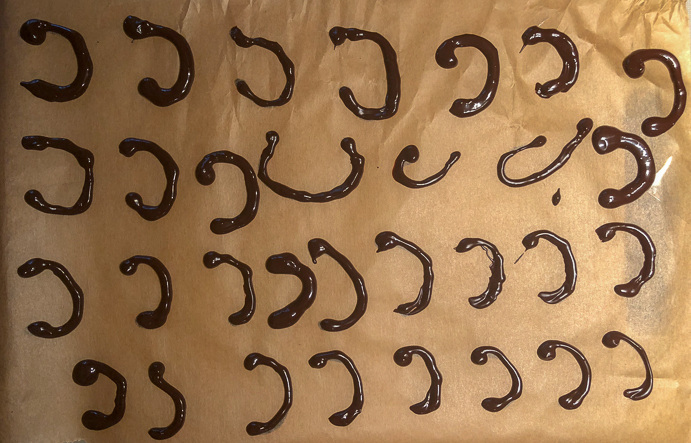 Carefully pipe the chocolate on to the lined baking sheet into small ‘C’ shapes or some sort of shape that resembling cup handles. If you can do that you are a better baker than I am. Here’s the idiot’s guide that I had to do. I measured the height of the cheesecakes and tried to create shapes that I thought would fit i.e. would sit on top of the cakes and go down the side and look a bit like cup handles. Then, on the back of the parchment paper, I used a Sharpie marker to draw the cup handle shape. You want to make a ‘C’ shape with a bit of a dot at each end. I ended up making 31 squiggles of different shapes and sizes. Flip the paper over so the ink is on the other side. I sellotaped the parchment paper to the back of a baking tray so the paper wouldn’t slip. Take another piece of parchment paper and roll it into a cone and cut a bit off the end. Watch how the expert does it in this YouTube video. Then pipe the shapes as best you can but don’t stress it as nobody will be looking at them too closely. When you are done piping and have at least 12 that you are happy with, place the tray in the fridge until they are solid. Leave in the fridge until you are ready to use them. If the tray doesn’t fit in the fridge, place the shapes somewhere cool until they firm up. Prepare the whipped cream – either open the tub of pre-whipped cream or whip up your own. Take the cakes out of the fridge and remove the paper cases. 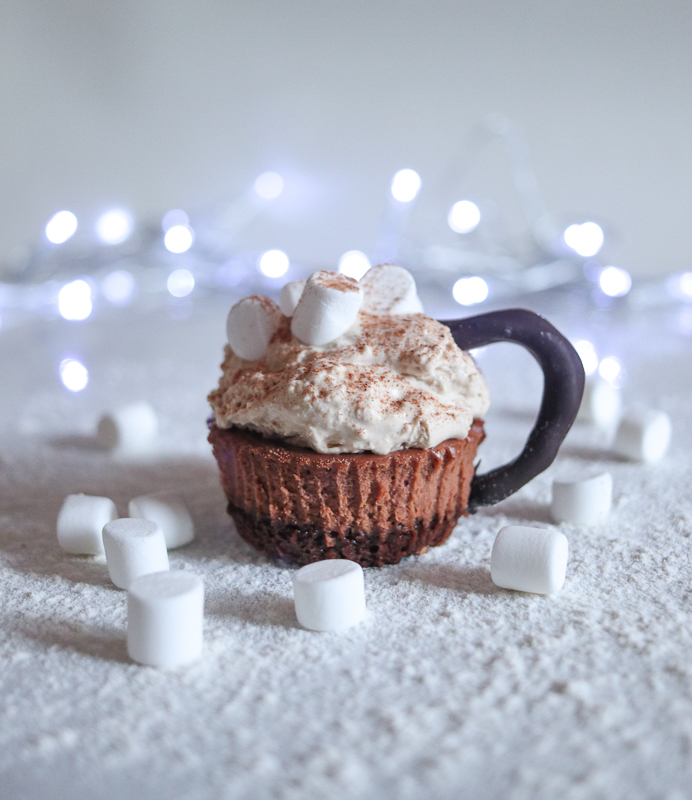 Top each hot chocolate mini cheesecake with whipped cream. Place some mini marshmallows on top of the cream. Dust the marshmallows with the remaining cocoa or hot chocolate powder. Take the chocolate handles out of the fridge. Place one on each cheesecake. You can stick the bottom of the handle into the chocolate filling and top into the cream. If they don’t fit, just shove the handles on the side any way you can. Be grand! Store in an airtight container in the fridge. If you are using fresh whipped cream, keep them for about two days. Otherwise, the actual cheesecakes themselves will keep in the airtight container in the fridge for about 5 days. 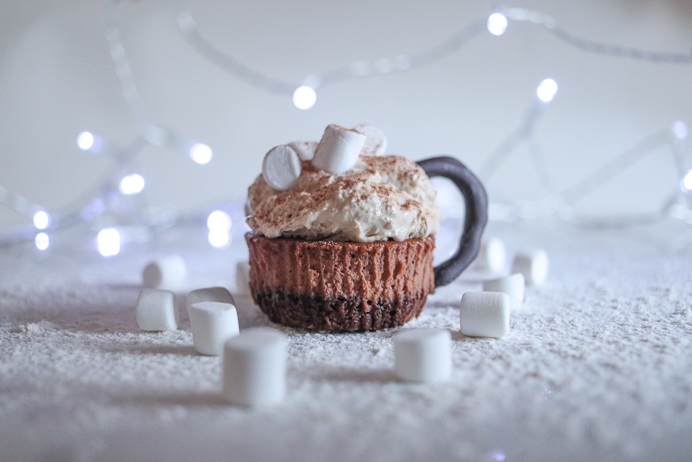 So, what do you think of my Hot Chocolate Mini Cheesecake Recipe? Did you try it out? Did you like it? What improvements would you make? Share a photo of your own attempt at this scones recipe or leave any feedback and comments below, I’d love to hear from you. If you liked this Hot Chocolate Mini Cheesecake Recipe you might also like my foolproof scones recipe. You might also like the recipe for my chocolate frosted cake with salted caramel sauce. 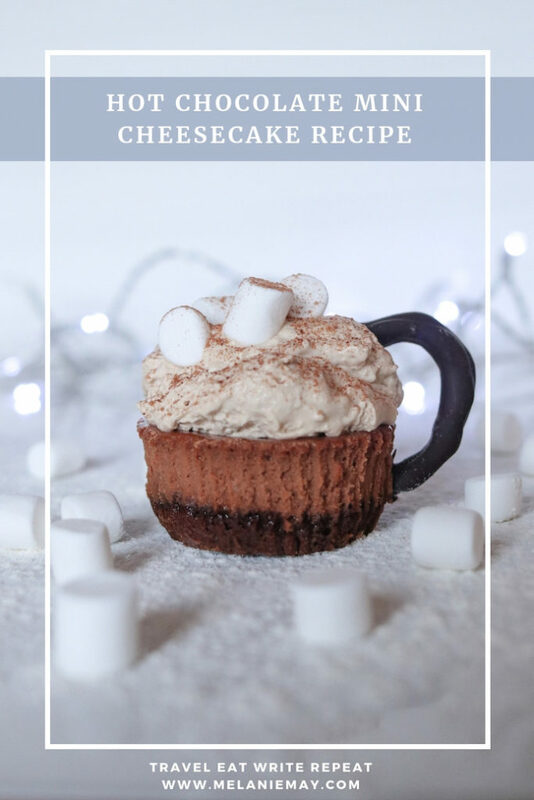 If you like this Hot Chocolate Mini Cheesecake Recipe, please share with others. I can’t get past how cute and clever the presentation is!! Adorable! Super cute and clever. If you make them, I hope you enjoy them. Oh my goodness this is absolutely adorable! And YUMMY. I’m totally pinning for later. Oh they are so adorable. Glad you like them. Thank you.